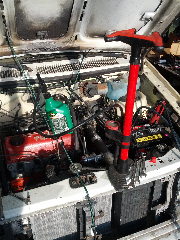 The engine in the Turbo Van is a fresh assembly that's never seen oil. After repeated cranking on the starter left the oil pressure sensor dry I decided to force oil into it. I emptied a quart of quaker state and installed a valve stem in the cap. In the bottom of the (empty) bottle I threaded a brake line and secured it with a tube nut. An ample coating of JB Weld sealed the fitting. On the other end, the brake line threaded into the oil pressure switch boss. With everything connected I filled the bottle with oil and connected the bike pump. At 20psi the bottle puffed out enough that I feared a Deep Water Horizon like oil explosion and I stopped pumping. It took nearly 20 minutes to transfer a quart of 10W30, not the fastest way to change your oil. After a quart and a half, I figured the oil pump should be well primed and I poured the rest in the top of the motor. Now that the oil system is primed, I just need to figure out why it won't start. Hahaha I love it. I bet it won't start because the car gods don't want another caravan on the road.